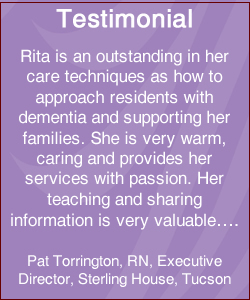 Founded by dementia specialist Rita Anand, Dementia Angels is an “extended family” of kind, trusted professionals to help navigate that maze. Our professional team provides extraordinary services with compassionate and genuine heart. Dementia Angels offers a “one stop care” of resources and support services specifically designed to help those facing the physical, mental and emotional challenges inherent in the beginning, middle and end stages of dementia. Every associate is highly committed to superior, personalized customer service in environments that are inviting, caring and hospitable. Currently located primarily in Phoenix, Arizona, Dementia Angels are experts at listening and identifying each customers’ individual needs and preferences -- and then delivering products and services with kindness and professionalism exceeding all expectations. Through customer feedback and ongoing education and networking, Dementia Angels will continually enhance and broaden its offerings to meet the needs of care givers and seniors nationwide. Our caring and professional team will continue to Visit to ensure continuation of quality care. WE CARE!